China has built a new lightweight electronic intelligence aircraft based off an Austrian-made turbo-prop utility plane, Popular Science revealed in March 2016. The so-called “Scout” Electronic Reconnaissance Aircraft-CSA003 has been built by the China Electronic Technology Corporation’s Avionics division. It is unknown how many aircraft have already been inducted and into what service. Popular Science points out that given EU arms restrictions, the aircraft may initially be deployed in paramilitary missions like border patrol. A variant of the plane is also deployed as a maritime patrol aircraft. 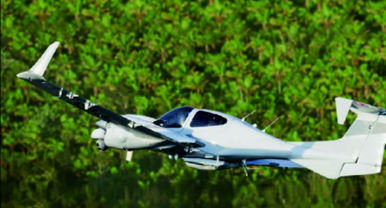 The CSA003 uses the carbon composite air-frame of the Diamond DA42, a four-seat light twin-engine utility and trainer aircraft produced by Austrian aircraft maker Diamond Aircraft Industries (DAI), the world’s largest manufacturer of full composite aircraft. DAI established a production facility in China in 2006. In 2008, DAI and the Civil Aviation University of China (CAUC) signed a contract for the procurement of 40 DA40 and ten DA42 aircraft to be used for pilot training. DAI has been cooperating with CAUC ever since. DA42 aircraft have been in service with a number of air forces including the Ghana Air Force, the Royal Thai Air Force, the Royal Air Force, the Ukraine Border Guard Service, and the Swiss Military Procurement Agency Armasuisse, as well as the Argentine Army. The sensor payload, carried in a pod under the fuselage, consists of a modern, digital ELINT [Electronic Intelligence] and signals processing suite that can detect, track and analyze enemy electronic activities, such as communications, weapons guidance and radars. The CSA-003 also has the capability for installing an electro optical/infrared sensor turret, which can detect enemy regular and irregular forces like infantry under all weather conditions. The CSA-003 can count on satellite links and processing support from ground stations to act as part of a larger network of integrated electronic attack assets. Electronic intelligence and warfare aircraft are critical in degrading an adversary’s capability to launch electronic and cyberattacks. They collect electronic and cyber intelligence on the battlefield and can both disrupt enemy electronic warfare operations and launch attacks involving the electromagnetic spectrum (e.g., jamming enemy radar).